A TRIP to hospital isn't what you'd hope for during your first day on The Bachelor. Jamie-Lee was one of three intruders to enter the fray on Ten's reality dating show tonight, and during a friend game of 'moonhopper' netball. 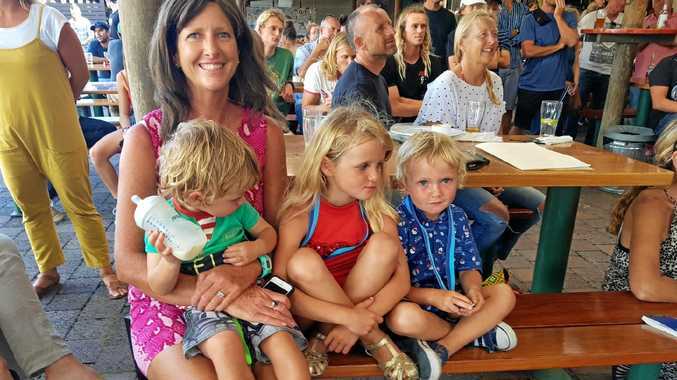 The 27-year-old venue manager, who lives in Sydney but grew up in Brunswick Heads and attended Mullumbimby High School before moving to Kiama with her family to finish Years 11 and 12, rolled her ankle in a friendly tackle by fellow bachelorette Brooke. As a professional rugby union player, Bachelor Nick Cummins came straight to Jamie-Lee's aid and carried her off the field. "I'm in a bit of pain and Nick, the poor thing, has to look at me crying. It is so embarrassing," she said. She later returned to the cocktail party with crutches and a moon boot as the accessories to her stunning green sequin gown. Once again, Nick swept her up in his arms and carried her off for a one-on-one chat. "He's making me feel like a feather," she said. "It's kind of attracting being in these big arms." He then gave her the first rose at the rose ceremony - much to the shock of the original bachelorettes who assumed at least one of the intruders would be sent packing. There's clearly chemistry between the pair, with Nick commenting he felt "good vibes" with Jamie-Lee early on. He promised to give them the "chance and time" for their connection to grow. The Bachelor continues tomorrow at 7.30pm on Channel 10.